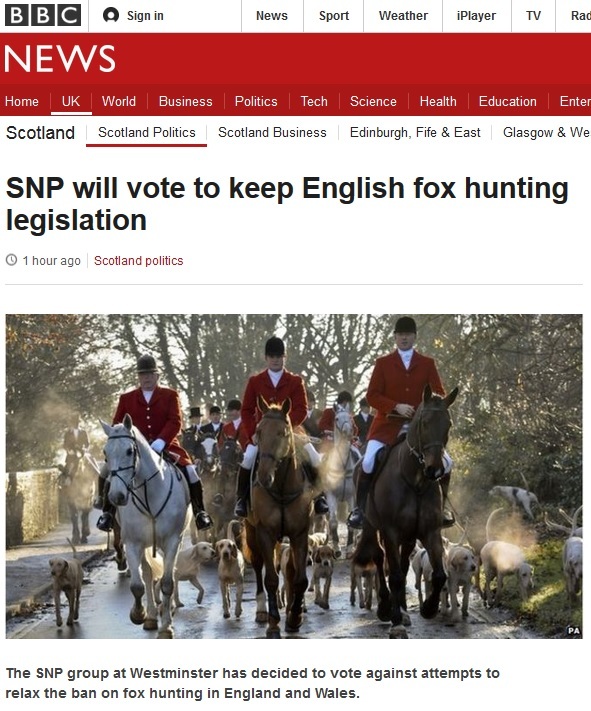 The 56 SNP MPs at Westminster are to vote against the proposed relaxing of the current legislation on hunting foxes with dogs in England and Wales. This appears to break the SNP’s self-imposed rule on not voting on devolved matters which have no effect on Scotland. The reason that they give is that there is a review being conducted at Holyrood into whether the existing Scottish ban, which allows for the flushing out of a fox with a pack of dogs instead of the permitted 2 in England and Wales, is strong enough. This seems a fairly minor Scottish interest to me. Others of a more English bent would probably say that there is no Scottish interest whatsoever. Like the BBC for instance. Notice how the headline states “English” yet the body of the story says “England and Wales”. The folks at the BBC know that the majority of people won’t read past the headline. This a risible attempt to inflame anti Scottish opinion by our national broadcaster. But this a relatively minor issue compared to the others which are continuously spewed out by the government’s main propaganda organ. So what’s afoot? Well there is a possibility that the combined efforts of the SNP, Labour (if they bother to vote), the Lib Dems, a few tory backbench rebels and assorted others could inflict a defeat on the tories. After all their majority is wafer thin, like those wee chocolate coated mints that you get after Christmas dinner. That would anger the tories no end, Boris would go so scarlet with apoplexy that he would look like a giant strawberry and cream lollipop. The tories’ plans for EVEL are quite bizarre, for while they move the fulcrum in Westminster to the English advantage they also move the fulcrum in Scotland to the separatists’ advantage thus providing extra leverage in their pursuit of an independent Scotland. So maybe that’s it? Or it could be a chance to shove a hunting horn up some posh tory jacksees. Either way I’m happy. The featured image at the top of the page is courtesy of Fox in Parliament. This entry was posted in UK on 13th July 2015 by the45.